If it's an even year, it's time for a girlfriend trip! This year, the six of us were in Nashville, Tennessee. 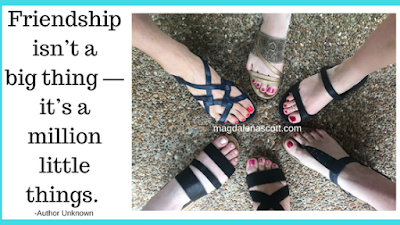 Although our friendships began as early as kindergarten, in the small Indiana town where I still live, everyone else now resides in a different state. Our Tennessee friend hosted us in her lovely home. She also planned excursions to keep us busy, while leaving plenty of free time to sit around her living room and chat. It may have been two years since we gathered, but it always feels as if we pick up in the middle of a conversation. * Friday night show at the Grand Ole Opry! The evening's talented musicians ranged in age from 11-year-old Mason Ramsey to veteran "Whispering" Bill Anderson. (The music! The enthusiastic crowd! The MC doing ads for the live radio broadcast!) I love that all generations of musicians were represented, and seemed to have a real family feeling for each other. * A live show, Sunday brunch, and cruise aboard the General Jackson Showboat. We had good seats at the Opry, but at this show, our table was very near the stage. The quartet and three-piece band were all great. I was in tears when pianist Jason Coleman played a "duet" with his granddad, Floyd Cramer, by way of a video recording. It's a big deal that I bought a CD from Jason, considering how strict I am on purchasing "things" to bring into my minimalist life. Until that moment, my only physical souvenir was a magnet for the "trips" section of my fridge. On Monday, I unpacked my suitcase to "Legacy," and listen to it each morning. * A stroll through the always-jaw-dropping Opryland Hotel. Oh. My. Word. Here's a photo of me inside the hotel. (Yes there is a river. Waterfalls, too. Indoors. And of course, giant cowboy boots.) A man was playing and singing in one of the "open air" restaurants we passed. In the few minutes I listened, he did a beautiful job with both a John Denver cover and a Beatles cover. You can see my video of the hotel by visiting my Facebook page. I tried to upload it here, but no luck. 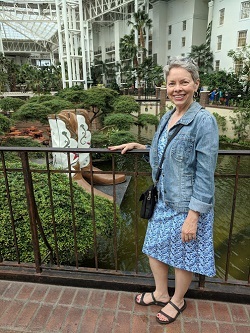 The Romance Writers of America conference is scheduled to be held in the Opryland Hotel in July, 2021. 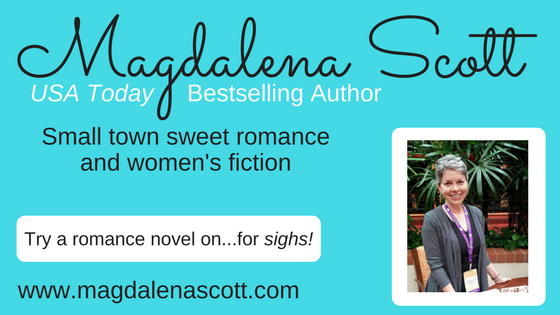 So, romance writers, start saving your pennies! It's just a short walk from the hotel to the Opry, to the mooring for the General Jackson, and to the Opryland Mills Mall. Live music. Lots and lots of it! What is your favorite thing to look for when visiting a new city? 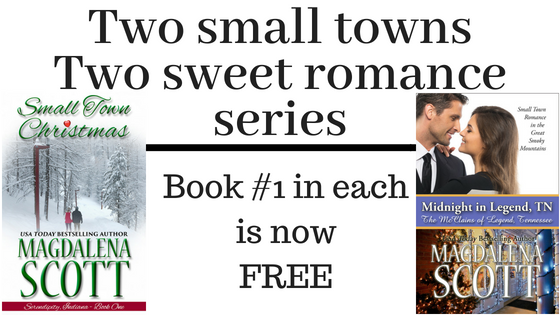 And don't miss her Free Books page. You can download a series starter (The McClains of Legend, Tennessee and Serendipity, Indiana) from your favorite vendor by clicking here. Nashville would be a great place to revisit. I went to college there and was born in Nashville at Vanderbilt Hospital. Oh goodness, you really have history in Nashville, Margaret! I hope that, if you attend RWA in 2021, I'll get to see you! I have a little travel envy - I have always wanted to see Nashville. I watched every episode of “Nashville” on TV & cried a little at the end of the series finale this week. Pam, you would have loved it. Charles Esten was celebrating his 100th appearance at the Grand Ole Opry, the night we were there. I love girlfriend trips! I take one every other year with a group of girlfriends. Sometimes there are just 3 of us. Sometimes there are 8 or more. We always have a great time! Sounds like a lovely trip. And how wonderful to still have such close friendships with people you've known since childhood! Thank you for reading, Milou! Yes, those long-time friendships are precious! It would be great to see you there, Shanna!